Cold roast beef is popular in Scandinavia and is served with a choice of remoulade sauce, potato salad and fried onions. This dish is perfect on its own as a lunch, dinner or even as a starter. Brown on all sides and baste with the butter. If the pan is oven safe, put it in the oven, otherwise transfer the roast beef to an oven proof dish and add the melted butter. Cook until the inner temperature of the roast beef reaches 60° C (140 degrees Fahrenheit). Take the roast beef out of the oven and cool it down. Refrigerate it until it is cold. Peel and boil the potatoes. Let the potatoes cool completely. Chop the onions and dill very fine. Cut the potatoes into 7 mm cubes. Mix the potato cubes, onions, dill, creme fraiche and some salt gently with a spoon. Refrigerate it. Combine all the Components in a pot and bring to a boil. Stir until the sugar is dissolved. Let it cool down and then refrigerate it. Strain the pickles and add them to the bowl. Heat the oil to 160° C (320 degrees Fahrenheit). excess. Shape a rectangle of onions onto an offset spatula and dip it into the frying oil. Use two forks to shape the nest into a long shape. Drain the onion nest onto a paper towel and continue with the other three onion nests. potato salad on them. Roll it into a roulade. Stand the roulade up on the plate. 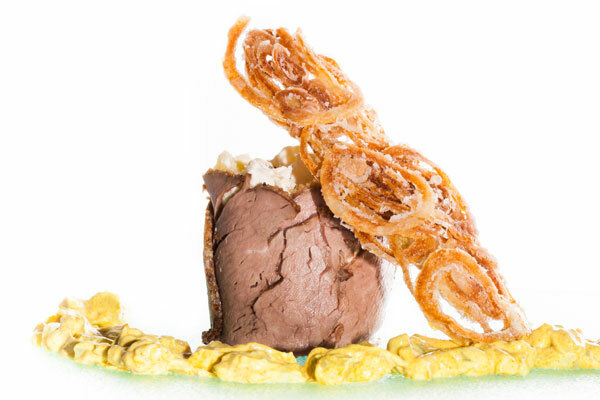 Pour some remoulade sauce around the roulade and serve with the deep fried onion nest.